Hey there EpicDuelists- we’re coming up to another Friday the 13th (along with the return of the F13 cheevo) and the continuation of the Infernal Infiltration War! Legion may have felled the first Vault door, but there’s still time for the Exiles to catch up, with the 2nd Vault battle already underway! The Second Vault Door is already feeling the pain (metaphorically speaking- the Vault Door is a Door, and cannot feel pain) of thousands of both Legion and Exile soldiers. And players will have something valuable to fight for- upon the collapse of the Second Vault Door, Level 35 will be available for your grinding pleasure! 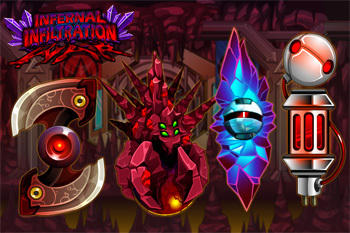 Along with unlocking Level 35, behind the door is a shop featuring Level 35 Sidearms (in both credit and varium flavors) that include the new special Infernal Spirit! This allows you to inflict +2 damage against the Vault and +2 Defense against its attacks. For a player wearing the Mechachillid armor, and wielding the Infernal Interdictor, this means that that Vault door doesn’t stand a chance! When life gives you gren, make grenades! We’ll be introducing four NEW grenades to make the battle against the Vault even more epic: The Stagrenade, Crystal Grenade, Hammer Grenade, and the Short Circuit Grenade. While all four will be available for purchase, anyone can get one of these grenades via a drop. Stalagrenade: As you may have noticed, as the battle progresses, the Vault’s defenses and attacks increase. To counteract this, the Stagrenade sticks to the Vault door and detonates, resetting its defenses and damage to the start. Crystal Grenade: Locks the Vault’s defenses in place, effectively giving you a free attack! Hammer Grenade: Has a chance to do minimal or massive damage to the Vault- all beholden to the RNG gods. Short Circuit Grenade: Causes the Vault’s defenses to backfire, making it attack itself! 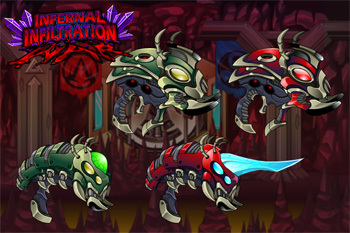 For more information, on how these Grenades work, check out this video on EpicDuel's Official Youtube Channel! As stated above, all of these grenades are available as War Battle Drops (or as rewards for upcoming War missions), as well as for purchase. If you manage to get a chance between bashing down the Vault door, AQW’s Friday the 13th event featuring Voltaire, the Beast Maker, and the Sleezter Bunny will be going LIVE on Friday. And if you’re as much of an audiophile as I am, you’ll love hearing Voltaire’s dulcet tones accompanying you through a voyage of mirth, mayhem, and weird hellbeasts.